Caavan Parks Tasmania directory is the place for all caravan parks, campervan, recreational vehicle (RV), motorhome, camping grounds, tourist parks, or holiday parks cabin adventure anywhere in Tasmania. 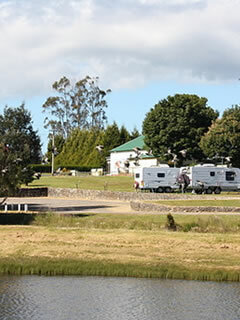 Read infomration on each caravan park in Tasmania or search Caravan to find the park your are looking for in Tasmania. Ths site is for anyone interested in caravans, campervans, motorhomes, mamping and 4WDs holidays and adventures in Australia's island state - Tasmania. Please explore our site and we look forward to seeing you at one of Tassie's many great caravan parks in the near future! Respect the rights of other people like yourself enjoying a carvan holiday in Tasmania. Caravans are often close together, noise, pets, and other disturbances may annoy others so please be respectful of others at all times. If you are going camping and don't necessarily have a lot of experience or hjaven't had the tent out for a long time, practice putting up your the tent in your backyard before you leave. It will save time and also you’ll find out if any parts are missing or if the tent is damaged in any way and need repairing before you leave. Leave your travel itinerary with a friend or relative, or e-mail them a copy before you leave. Always include your car license plate number, where you intend to be each day, when you plan to return, and a mobile phone telephone contact number if you have one. Learn the basics of first aid before headin goff; Red Cross offer courses in basic first aid. It is a great skill and you never know when you will need to assist a friend, family member of fellow camper. Make sure your vehicle is in tip top mechanical condition before you leave. If you are towing a caravan be sure all mechanical and electrical parts are in perfect working order. You don't want to breakdown in an isolated part of Tassie with no communications! Check the weather report for the area where you will be camping in Tasmania; a week in the rain is not necessarily going to be a lot of fun! If you get caught in a thunderstorm, don’t take shelter under a tree - your caravan is a safer place. Always respect the local environment and camping or caravan restrictions. Keep fires within a contained area (if fires are allo0wed) with an outer ring of gravel or dirt to protect against the fire spreading. Note that most National Parks don't allow fires in the open, but rather provide firepots to keep you warm at night. Don't damage local trees; wood is generally provided. Wear covered footwear at all times when walking in the Tasmanian bush; we have many insects that can cause nasty stings that may in turn cause a bad reaction.Also, Tasmania has deadly snakes so be careful in Summer when walking in long grass or in areas where snakes are known to inhabit.